"Attlee" redirects here. For other uses, see Attlee (disambiguation). Clement Richard Attlee, 1st Earl Attlee, KG, OM, CH, PC, FRS (3 January 1883 – 8 October 1967) was a British statesman and Labour Party politician who served as Prime Minister of the United Kingdom from 1945 to 1951. He was the Leader of the Labour Party from 1935 to 1955. In 1940, Attlee took Labour into the wartime coalition government and served under Winston Churchill, becoming, in 1942, the first person to hold the office of Deputy Prime Minister of the United Kingdom. He went on to lead the Labour Party to an unexpected landslide victory at the 1945 general election; forming the first Labour majority government, and a mandate to implement its postwar reforms. The 12 percent national swing from the Conservatives to Labour was unprecedented at that time and remains the largest ever achieved by any party at a general election in British electoral history. He was re-elected with a narrow majority at the 1950 general election. In the following year, Attlee called a snap general election, hoping to increase his parliamentary majority. However, he was narrowly defeated by the Conservatives under the leadership of Winston Churchill, despite winning the most votes of any political party in any general election in British political history until the Conservative Party's fourth consecutive victory in 1992. Attlee remains the longest-ever serving Leader of the Labour Party. 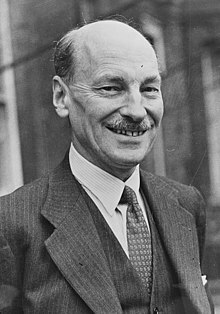 First elected to the House of Commons in 1922 as the MP for Limehouse, Attlee rose quickly to become a junior minister in the first Labour minority government led by Ramsay MacDonald in 1924, and then joined the Cabinet during MacDonald's second ministry of 1929–1931. One of only a handful of Labour frontbenchers to retain his seat in the landslide defeat of 1931, he became the party's Deputy Leader. After the resignation of George Lansbury in 1935, he was elected as Leader of the Labour Party and Leader of the Opposition in the subsequent leadership election. At first advocating pacificism and opposing rearmament, he later reversed his position; by 1938, he became a strong critic of Neville Chamberlain's attempts to appease Adolf Hitler and Benito Mussolini. He took Labour into the Churchill war ministry in 1940. Initially serving as Lord Privy Seal, he was appointed as Deputy Prime Minister in 1942. Attlee and Churchill worked together very smoothly, with Attlee working backstage to handle much of the detail and organisational work in Parliament, as Churchill took centre stage with his attention on diplomacy, military policy, and broader issues. With victory in Europe in May 1945, the coalition government was dissolved. Attlee led Labour to win a huge majority in the ensuing 1945 general election two months later. The government he led built the post-war consensus, based upon the assumption that full employment would be maintained by Keynesian policies and that a greatly enlarged system of social services would be created – aspirations that had been outlined in the 1942 Beveridge Report. Within this context, his government undertook the nationalisation of public utilities and major industries, as well as the creation of the National Health Service. Attlee himself had little interest in economic matters but this settlement was broadly accepted by all parties for three decades. Foreign policy was the special domain of Ernest Bevin, but Attlee took special interest in India. He supervised the process by which India was partitioned into India and Pakistan in 1947. He also arranged the independence of Burma (Myanmar), and Ceylon (Sri Lanka). His government ended the British Mandates of Palestine and Jordan. From 1947 onwards, he and Bevin pushed the United States to take a more vigorous role in the emerging Cold War against Soviet Communism. When the budgetary crisis forced Britain out of Greece in 1947, he called on Washington to counter the Communists with the Truman Doctrine. He avidly supported the Marshall Plan to rebuild Western Europe with American money. In 1949, he promoted the NATO military alliance against the Soviet bloc. He sent British troops to fight in the Malayan Emergency in 1948 and sent the RAF to participate in the Berlin Airlift. He commissioned an independent nuclear deterrent for the UK. He used 13,000 troops and passed special legislation to promptly end the London dock strike in 1949. After leading Labour to a narrow victory at the 1950 general election, he sent British troops to fight in the Korean War. Attlee was narrowly defeated by the Conservatives under Churchill in the 1951 general election. He continued as Labour leader but had lost his effectiveness by then. He retired after losing the 1955 general election and was elevated to the House of Lords. In public, Attlee was modest and unassuming; he was ineffective at public relations and lacked charisma. His strengths emerged behind the scenes, especially in committees where his depth of knowledge, quiet demeanour, objectivity, and pragmatism proved decisive. His achievements in politics owed much to lucky breaks and the unsuitability of his rivals. He saw himself as spokesman on behalf of his entire party and successfully kept its multiple factions in harness. Attlee is consistently rated by scholars, critics and the public as one of the greatest British Prime Ministers. His reputation among scholars in recent decades has been much higher than during his years as Prime Minister, thanks to his roles in leading the Labour Party, creating the welfare state and building the coalition opposing Stalin in the Cold War. Attlee was born on 3 January 1883 in Putney, Surrey (now part of London), into a middle-class family, the seventh of eight children. His father was Henry Attlee (1841–1908), a solicitor, and his mother was Ellen Bravery Watson (1847–1920), daughter of Thomas Simons Watson, secretary for the Art Union of London. He was educated at Northaw School, a boys' preparatory school near Pluckley in Kent; Haileybury College; and University College, Oxford, where in 1904 he graduated as a Bachelor of Arts with second-class honours in modern history. Attlee then trained as a barrister at the Inner Temple and was called to the bar in March 1906. He worked for a time at his father's law firm Druces and Attlee but did not enjoy the work, and had no particular ambition to succeed in the legal profession. He also played football for non-League club Fleet. In 1906, he became a volunteer at Haileybury House, a charitable club for working-class boys in Stepney in the East End of London run by his old school, and from 1907 to 1909 he served as the club's manager. Until then, his political views had been more conservative. However, after his shock at the poverty and deprivation he saw while working with the slum children, he came to the view that private charity would never be sufficient to alleviate poverty and that only direct action and income redistribution by the state would have any serious effect. This sparked a process that caused him to convert to socialism. He subsequently joined the Independent Labour Party (ILP) in 1908 and became active in local politics. In 1909, he stood unsuccessfully at his first election, as an ILP candidate for Stepney Borough Council. He also worked briefly as a secretary for Beatrice Webb in 1909, before becoming a secretary for Toynbee Hall. In 1911, he was employed by the UK Government as an "official explainer"—touring the country to explain Chancellor of the Exchequer David Lloyd George's National Insurance Act. He spent the summer of that year touring Essex and Somerset on a bicycle, explaining the act at public meetings. A year later, he became a lecturer at the London School of Economics. Following the outbreak of the First World War in August 1914, Attlee applied to join the British Army. Initially his application was turned down, as at age 31 he was seen as too old; however, he was finally allowed to join in September, and was commissioned in the rank of Captain with the 6th (Service) Battalion, South Lancashire Regiment, part of the 38th Brigade of the 13th (Western) Division, and was sent to fight in the Gallipoli Campaign in Turkey. His decision to fight caused a rift between him and his older brother Tom, who, as a conscientious objector, spent much of the war in prison. After a period fighting in Gallipoli, he collapsed after falling ill with dysentery and was put on a ship bound for England to recover. When he woke up he wanted to get back to action as soon as possible, and asked to be let off the ship in Malta where he stayed in hospital to recover. His hospitalisation coincided with the Battle of Sari Bair, which saw a large number of his comrades killed. Upon returning to action, he was informed that his company had been chosen to hold the final lines during the evacuation of Suvla. As such, he was the penultimate man to be evacuated from Suvla Bay, the last being General Stanley Maude. 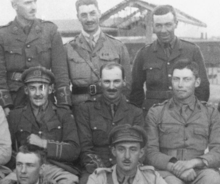 Attlee (seen in the centre) in 1916, aged 33, whilst serving in Mesopotamia. The Gallipoli Campaign had been engineered by the First Lord of the Admiralty, Winston Churchill. Although it was unsuccessful, Attlee believed that it was a bold strategy, which could have been a success if it had been better implemented on the ground. This gave him an admiration for Churchill as a military strategist, which would make their working relationship in later years productive. He later served in the Mesopotamian Campaign in what is now Iraq, where in April 1916 he was badly wounded, being hit in the leg by shrapnel while storming an enemy trench during the Battle of Hanna. He was sent firstly to India, and then back to the UK to recover. In February 1917, he was promoted to the rank of Major, leading him to be known as "Major Attlee" for much of the inter-war period. He would spend most of 1917 training soldiers at various locations in England. From 2 to 9 July 1917, he was the temporary commanding officer (CO) of the newly formed L (later 10th) Battalion, the Tank Corps at Bovington Camp, Dorset. From 9 July, he assumed command of 30th Company of the same battalion however he did not deploy to France with it in December 1917. After fully recovering from his injuries, he was sent to France in June 1918 to serve on the Western Front for the final months of the war. After being discharged from the Army in January 1919, he returned to Stepney, and returned to his old job lecturing part-time at the London School of Economics. Lady Janet Helen (1923-2019); she married Harold Shipton at Ellesborough Parish Church in 1947. Lady Alison Elizabeth (1930–2016), married Richard Davis at Great Missenden in 1952. Attlee returned to local politics in the immediate post-war period, becoming mayor of the Metropolitan Borough of Stepney, one of London's most deprived inner-city boroughs, in 1919. During his time as mayor, the council undertook action to tackle slum landlords who charged high rents but refused to spend money on keeping their property in habitable condition. The council served and enforced legal orders on homeowners to repair their property. It also appointed health visitors and sanitary inspectors, reducing the infant mortality rate, and took action to find work for returning unemployed ex-servicemen. In a civilised community, although it may be composed of self-reliant individuals, there will be some persons who will be unable at some period of their lives to look after themselves, and the question of what is to happen to them may be solved in three ways – they may be neglected, they may be cared for by the organised community as of right, or they may be left to the goodwill of individuals in the community. Charity is only possible without loss of dignity between equals. A right established by law, such as that to an old age pension, is less galling than an allowance made by a rich man to a poor one, dependent on his view of the recipient's character, and terminable at his caprice. In 1921, George Lansbury, the Labour mayor of the neighbouring borough of Poplar, and future Labour Party leader, launched the Poplar Rates Rebellion; a campaign of disobedience seeking to equalise the poor relief burden across all the London boroughs. Attlee, who was a personal friend of Lansbury strongly supported this, however Herbert Morrison, the Labour mayor of nearby Hackney, and one of the main figures in the London Labour Party, strongly denounced Lansbury and the rebellion. During this period, Attlee developed a lifelong dislike of Morrison. At the 1922 general election, Attlee became the Member of Parliament (MP) for the constituency of Limehouse in Stepney. At the time, he admired Ramsay MacDonald and helped him get elected as Labour Party leader at the 1922 leadership election. He served as MacDonald's Parliamentary Private Secretary for the brief 1922 parliament. His first taste of ministerial office came in 1924, when he served as Under-Secretary of State for War in the short-lived first Labour government, led by MacDonald. Attlee opposed the 1926 General Strike, believing that strike action should not be used as a political weapon. However, when it happened, he did not attempt to undermine it. At the time of the strike, he was chairman of the Stepney Borough Electricity Committee. He negotiated a deal with the Electrical Trade Union so that they would continue to supply power to hospitals, but would end supplies to factories. One firm, Scammell and Nephew Ltd, took a civil action against Attlee and the other Labour members of the committee (although not against the Conservative members who had also supported this). The court found against Attlee and his fellow councillors and they were ordered to pay £300 damages. The decision was later reversed on appeal, but the financial problems caused by the episode almost forced Attlee out of politics. In 1927, he was appointed a member of the multi-party Simon Commission, a royal commission set up to examine the possibility of granting self-rule to India. Due to the time he needed to devote to the commission, and contrary to a promise MacDonald made to Attlee to induce him to serve on the commission, he was not initially offered a ministerial post in the Second Labour Government, which entered office after the 1929 general election. Attlee's service on the Commission equipped him with a thorough exposure to India and many of its political leaders. By 1933 he argued that British rule was alien to India and was unable to make the social and economic reforms necessary for India's progress. He became the British leader most sympathetic to Indian independence (as a dominion), preparing him for his role in deciding on independence in 1947. In May 1930, Labour MP Oswald Mosley left the party after its rejection of his proposals for solving the unemployment problem, and Attlee was given Mosley's post of Chancellor of the Duchy of Lancaster. In March 1931, he became Postmaster General, a post he held for five months until August, when the Labour government fell, after failing to agree on how to tackle the financial crisis of the Great Depression. That month MacDonald and a few of his allies formed a National Government with the Conservatives and Liberals, leading them to be expelled from Labour. MacDonald offered Attlee a job in the National Government, but he turned down the offer and opted to stay loyal to the main Labour party. In the old days I had looked up to MacDonald as a great leader. He had a fine presence and great oratorical power. The unpopular line which he took during the First World War seemed to mark him as a man of character. Despite his mishandling of the Red Letter episode, I had not appreciated his defects until he took office a second time. I then realised his reluctance to take positive action and noted with dismay his increasing vanity and snobbery, while his habit of telling me, a junior Minister, the poor opinion he had of all his Cabinet colleagues made an unpleasant impression. I had not, however, expected that he would perpetrate the greatest betrayal in the political history of this country... The shock to the Party was very great, especially to the loyal workers of the rank-and-file who had made great sacrifices for these men. The 1931 general election held later that year was a disaster for the Labour Party, which lost over 200 seats, returning only 52 MPs to Parliament. The vast majority of the party's senior figures lost their seats, including the Leader Arthur Henderson, Attlee narrowly retained his Limehouse seat in the election, with his majority being slashed from 7,288 to just 551. He was one of only three Labour MPs who had experience of government to retain their seats, along with George Lansbury and Stafford Cripps, accordingly Lansbury was elected Leader unopposed with Attlee as his deputy. Most of the remaining Labour MPs after 1931 were elderly trade union officials who could not contribute much to debates, Lansbury was in his 70s, and Stafford Cripps another main figure of the Labour front bench who had entered Parliament in 1931, was inexperienced. As one of the most capable and experienced of the remaining Labour MPs, Attlee therefore shouldered a lot of the burden of providing an opposition to the National Government in the years 1931–35, during this time he had to extend his knowledge of subjects which he had not studied in any depth before, such as finance and foreign affairs in order to provide an effective opposition to the government. Attlee effectively served as acting leader for nine months from December 1933, after Lansbury fractured his thigh in an accident, which raised Attlee's public profile considerably. It was during this period, however, that personal financial problems almost forced Attlee to quit politics altogether. His wife had become ill, and at that time there was no separate salary for the Leader of the Opposition. On the verge of resigning from Parliament, he was persuaded to stay by Stafford Cripps, a wealthy socialist, who agreed to make a donation to party funds to pay him an additional salary until Lansbury could take over again. During 1932–33 Attlee flirted with, and then drew back from radicalism, influenced by Stafford Cripps who was then on the radical wing of the party, he was briefly a member of the Socialist League, which had been formed by former Independent Labour Party (ILP) members, who opposed the ILP's disaffiliation from the main Labour Party in 1932. At one point he agreed with the proposition put forward by Cripps that gradual reform was inadequate and that a socialist government would have to pass an emergency powers act, allowing it to rule by decree to overcome any opposition by vested interests until it was safe to restore democracy. He admired Oliver Cromwell's strong-armed rule and use of major generals to control England. After looking more closely at Hitler, Mussolini, Stalin, and even his former colleague Oswald Mosley, leader of the new blackshirt fascist movement in Britain, Attlee retreated from his radicalism, and distanced himself from the League, and argued instead that the Labour Party must adhere to constitutional methods and stand forthright for democracy and against totalitarianism of either the left or right. He always supported the crown, and as Prime Minister was close to King George VI. George Lansbury, a committed pacifist, resigned as the Leader of the Labour Party at the 1935 Party Conference on 8 October, after delegates voted in favour of sanctions against Italy for its aggression against Abyssinia. Lansbury had strongly opposed the policy, and felt unable to continue leading the party. Taking advantage of the disarray in the Labour Party, the Prime Minister Stanley Baldwin announced on 19 October that a general election would be held on 14 November. With no time for a leadership contest, the party agreed that Attlee should serve as interim leader, on the understanding that a leadership election would be held after the general election. Attlee therefore led Labour through the 1935 election, which saw the party stage a partial comeback from its disastrous 1931 performance, winning 38 per cent of the vote, the highest share Labour had won up to that point, and gaining over one hundred seats. Attlee stood in the subsequent leadership election, held soon after, where he was opposed by Herbert Morrison, who had just re-entered parliament in the recent election, and Arthur Greenwood: Morrison was seen as the favourite, but was distrusted by many sections of the party, especially the left-wing. Arthur Greenwood meanwhile was a popular figure in the party; however his leadership bid was severely hampered by his alcohol problem. Attlee was able to come across as a competent and unifying figure, particularly having already led the party through a general election. He went on to come first in both the first and second ballots, formally being elected Leader of the Labour Party on 3 December 1935. Throughout the 1920s and most of the 1930s, the Labour Party's official policy had been to oppose rearmament, instead supporting internationalism and collective security under the League of Nations. At the 1934 Labour Party Conference, Attlee declared that, "We have absolutely abandoned any idea of nationalist loyalty. We are deliberately putting a world order before our loyalty to our own country. We say we want to see put on the statute book something which will make our people citizens of the world before they are citizens of this country." During a debate on defence in Commons a year later, Attlee said "We are told (in the White Paper) that there is danger against which we have to guard ourselves. We do not think you can do it by national defence. We think you can only do it by moving forward to a new world. A world of law, the abolition of national armaments with a world force and a world economic system. I shall be told that that is quite impossible." Shortly after those comments, Adolf Hitler proclaimed that German rearmament offered no threat to world peace. Attlee responded the next day noting that Hitler's speech, although containing unfavourable references to the Soviet Union, created "A chance to call a halt in the armaments race...We do not think that our answer to Herr Hitler should be just rearmament. We are in an age of rearmaments, but we on this side cannot accept that position." was the natural expression of the character of the present Government. There was hardly any increase allowed for the services which went to build up the life of the people, education and health. Everything was devoted to piling up the instruments of death. The Chancellor expressed great regret that he should have to spend so much on armaments, but said that it was absolutely necessary and was due only to the actions of other nations. One would think to listen to him that the Government had no responsibility for the state of world affairs....The Government has now resolved to enter upon an arms race, and the people will have to pay for their mistake in believing that it could be trusted to carry out a policy of peace.... This is a War Budget. We can look in the future for no advance in Social Legislation. All available resources are to be devoted to armaments. In June 1936, the Conservative MP Duff Cooper called for an Anglo-French alliance against possible German aggression and called for all parties to support one. Attlee condemned this: "We say that any suggestion of an alliance of this kind—an alliance in which one country is bound to another, right or wrong, by some overwhelming necessity—is contrary to the spirit of the League of Nations, is contrary to the Covenant, is contrary to Locarno is contrary to the obligations which this country has undertaken, and is contrary to the professed policy of this Government." At the Labour Party conference at Edinburgh in October Attlee reiterated that "There can be no question of our supporting the Government in its rearmament policy." However, with the rising threat from Nazi Germany, and the ineffectiveness of the League of Nations, this policy eventually lost credibility. By 1937, Labour had jettisoned its pacifist position and came to support rearmament and oppose Neville Chamberlain's policy of appeasement. We all feel relief that war has not come this time. Every one of us has been passing through days of anxiety; we cannot, however, feel that peace has been established, but that we have nothing but an armistice in a state of war. We have been unable to go in for care-free rejoicing. We have felt that we are in the midst of a tragedy. We have felt humiliation. This has not been a victory for reason and humanity. It has been a victory for brute force. At every stage of the proceedings there have been time limits laid down by the owner and ruler of armed force. The terms have not been terms negotiated; they have been terms laid down as ultimata. We have seen to-day a gallant, civilised and democratic people betrayed and handed over to a ruthless despotism. We have seen something more. We have seen the cause of democracy, which is, in our view, the cause of civilisation and humanity, receive a terrible defeat. ... The events of these last few days constitute one of the greatest diplomatic defeats that this country and France have ever sustained. There can be no doubt that it is a tremendous victory for Herr Hitler. Without firing a shot, by the mere display of military force, he has achieved a dominating position in Europe which Germany failed to win after four years of war. He has overturned the balance of power in Europe. He has destroyed the last fortress of democracy in Eastern Europe which stood in the way of his ambition. He has opened his way to the food, the oil and the resources which he requires in order to consolidate his military power, and he has successfully defeated and reduced to impotence the forces that might have stood against the rule of violence. At the end of 1937, Attlee and a party of three Labour MPs visited Spain and visited the British Battalion of the International Brigades fighting in the Spanish Civil War. One of the companies was named the "Major Attlee Company" in his honour. In the late 1930s, Attlee sponsored a Jewish mother and her two children, enabling them to leave Germany in 1939 and move to the UK. On arriving in Britain, Attlee invited one of the children into his home in Stanmore, north-west London, where he stayed for several months. Attlee remained as Leader of the Opposition when the Second World War broke out in September 1939. The ensuing disastrous Norwegian Campaign would result in a motion of no confidence in Neville Chamberlain. Although Chamberlain survived this, the reputation of his administration was so badly and publicly damaged that it became clear a coalition government would be necessary. Even if Attlee had personally been prepared to serve under Chamberlain in an emergency coalition government, he would never have been able to carry Labour with him. Consequently, Chamberlain tendered his resignation, and Labour and the Conservatives entered a coalition government led by Winston Churchill on 10 May 1940. Attlee and Churchill quickly agreed that the War Cabinet would consist of three Conservatives (initially Churchill, Chamberlain and Lord Halifax) and two Labour members (initially himself and Arthur Greenwood) and that Labour should have slightly more than one third of the posts in the coalition government. Attlee and Greenwood played a vital role in supporting Churchill during a series of War Cabinet debates over whether or not to negotiate peace terms with Hitler following the Fall of France in May 1940; both supported Churchill and gave him the majority he needed in the War Cabinet to continue Britain's resistance. Only Attlee and Churchill remained in the War Cabinet from the formation of the Government of National Unity in May 1940 through to the election in May 1945. Attlee was initially the Lord Privy Seal, before becoming Britain's first ever Deputy Prime Minister in 1942, as well as becoming the Dominions Secretary and the Lord President of the Council. Attlee himself played a generally low key but vital role in the wartime government, working behind the scenes and in committees to ensure the smooth operation of government. In the coalition government, three inter-connected committees effectively ran the country. Churchill chaired the first two, the War Cabinet and the Defence Committee, with Attlee deputising for him in these, and answering for the government in Parliament when Churchill was absent. Attlee himself instituted, and later chaired the third body, the Lord President's Committee, which was responsible for overseeing domestic affairs. As Churchill was most concerned with overseeing the war effort, this arrangement suited both men. Attlee himself had largely been responsible for creating these arrangements with Churchill's backing, streamlining the machinery of government and abolishing many committees. He also acted as a concilliator in the government, smoothing over tensions which frequently arose between Labour and Conservative Ministers. He looked and spoke like an insignificant elderly clerk, without distinction in the voice, manner or substance of his discourse. To realise that this little nonentity is the Parliamentary Leader of the Labour Party... and presumably the future P.M. [Prime Minister] is pitiable." Following the defeat of Nazi Germany and the end of the War in Europe in May 1945, Attlee and Churchill favoured the coalition government remaining in place until Japan had been defeated. However, Herbert Morrison made it clear that the Labour Party would not be willing to accept this, and Churchill was forced to tender his resignation as Prime Minister and call an immediate election. The war had set in motion profound social changes within Britain, and had ultimately led to a widespread popular desire for social reform. This mood was epitomised in the Beveridge Report of 1942, by the Liberal economist William Beveridge. The Report assumed that the maintenance of full employment would be the aim of post-war governments, and that this would provide the basis for the welfare state. Immediately on its release, it sold hundreds of thousands of copies. All major parties committed themselves to fulfilling this aim, but most historians say that Attlee's Labour Party were seen by the electorate as the party most likely to follow it through. Labour campaigned on the theme of "Let Us Face the Future," positioning themselves as the party best placed to rebuild Britain after the war,[note 1] and were widely viewed as having run a strong and positive campaign, while the Conservative campaign centred entirely around Churchill. Despite opinion polls indicating a strong Labour lead, opinion polls were then viewed as a novelty which had not proven their worth, and most commentators expected that Churchill's prestige and status as a "war hero" would ensure a comfortable Conservative victory. Before polling day, The Manchester Guardian surmised that "the chances of Labour sweeping the country and obtaining a clear majority ... are pretty remote". The News of the World predicted a working Conservative majority, while in Glasgow a pundit forecast the result as Conservatives 360, Labour 220, Others 60. Churchill however made some costly errors during the campaign. In particular, his suggestion during one radio broadcast that a future Labour Government would require "some form of a gestapo" to implement their policies was widely regarded as being in very bad taste, and massively backfired. When the results of the election were announced on 26 July, they came as a surprise to most, including Attlee himself. Labour had won power by a huge landslide, winning 47.7 per cent of the vote to the Conservatives' 36 per cent. This gave them 393 seats in the House of Commons, a working majority of 146. This was the first time in history that the Labour Party had won a majority in Parliament. 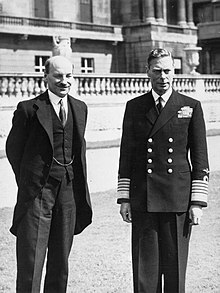 When Attlee went to see King George VI at Buckingham Palace to be appointed Prime Minister, the notoriously laconic Attlee and the famously tongue-tied King stood in silence; Attlee finally volunteered the remark, "I've won the election." The King replied "I know. I heard it on the Six O'Clock News." As Prime Minister, Attlee appointed Hugh Dalton as Chancellor of the Exchequer, Ernest Bevin as Foreign Secretary, and Herbert Morrison as Deputy Prime Minister, with overall responsibility for nationalisation. Additionally, Stafford Cripps was made President of the Board of Trade, Aneurin Bevan became Minister of Health, and Ellen Wilkinson, the only woman to serve in Attlee's government, was appointed Minister of Education. The Attlee government proved itself to be a radical, reforming government. From 1945 to 1948, over 200 public Acts of Parliament were passed, with eight major pieces of legislation placed on the statute book in 1946 alone. Francis (1995) argues there was consensus both in the Labour's national executive committee and at party conferences on a definition of socialism that stressed moral improvement as well as material improvement. The Attlee government was committed to rebuilding British society as an ethical commonwealth, using public ownership and controls to abolish extremes of wealth and poverty. Labour's ideology contrasted sharply with the contemporary Conservative Party's defence of individualism, inherited privileges, and income inequality. On 5 July 1948, Clement Attlee replied to a letter dated 22 June from James Murray and ten other MPs who raised concerns about West Indians who arrived on board the HMT Empire Windrush. As for the prime minister himself, he was not much focused on economic policy, letting others handle the issues. Attlee's Health Minister, Aneurin Bevan, fought hard against the general disapproval of the medical establishment, including the British Medical Association, by creating the National Health Service (NHS) in 1948. This was a publicly funded healthcare system, which offered treatment free of charge for all at the point of use. Reflecting pent-up demand that had long existed for medical services, the NHS treated some 8 and a half million dental patients and dispensed more than 5 million pairs of spectacles during its first year of operation. The government set about implementing the wartime plans of Liberal William Beveridge for the creation of a "cradle to grave" welfare state. It set in place an entirely new system of social security. Among the most important pieces of legislation was the National Insurance Act 1946, in which people in work were required to pay a flat rate of national insurance. In return, they (and the wives of male contributors) were eligible for a wide range of benefits, including pensions, sickness benefit, unemployment benefit, and funeral benefit. Various other pieces of legislation provided for child benefit and support for people with no other source of income. In 1949, unemployment, sickness and maternity benefits were exempted from tax. The New Towns Act of 1946 set up development corporations to construct new towns, while the Town and Country Planning Act of 1947 instructed county councils to prepare development plans and also provided compulsory purchase powers. The Attlee government also extended the powers of local authorities to requisition houses and parts of houses, and made the acquisition of land less difficult than before. The Housing (Scotland) Act of 1949 provided grants of 75 per cent (87.5 per cent in the highlands and islands) towards modernisation costs payable by Treasury to local authorities. In 1949, local authorities were empowered to provide people suffering from poor health with public housing at subsidised rents. To assist home ownership, the limit on the amount of money that people could borrow from their local authority to purchase or build a home was raised from £800 to £1,500 in 1945, and to £5,000 in 1949. Under the National Assistance act of 1948, local authorities had a duty "to provide emergency temporary accommodation for families which become homeless through no fault of their own." A large house-building programme was carried out with the intention of providing millions of people with high-quality homes. A housing bill passed in 1946 increased Treasury subsidies for the construction of local authority housing in England and Wales. Four out of five houses constructed under Labour were council properties built to more generous specifications than before the Second World War, and subsidies kept down council rents. Altogether, these policies provided public-sector housing with its biggest-ever boost up until that point, while low-wage earners particularly benefited from these developments. Although the Attlee government failed to meet its targets, primarily due to economic constraints, over a million new homes were built between 1945 and 1951 (a significant achievement under the circumstances) which ensured that decent, affordable housing was available to many low-income families for the first time ever. A number of reforms were embarked upon to improve conditions for women and children. In 1946, universal family allowances were introduced to provide financial support to households for raising children. These benefits had been legislated for the previous year by Churchill's Family Allowances Act 1945, and was the first measure pushed through parliament by Attlee's government. Conservatives would later criticise Labour for having been "too hasty" in introducing family allowances. A Married Women (Restraint Upon Anticipation) Act was passed in 1949 "to equalise, to render inoperative any restrictions upon anticipation or alienation attached to the enjoyment of property by a woman," while the Married Women (Maintenance) Act of 1949 was enacted with the intention of improving the adequacy and duration of financial benefits for married women. The Criminal Law (Amendment) Act of 1950 amended an Act of 1885 to bring prostitutes within the law and safeguard them from abduction and abuse. The Criminal Justice Act of 1948 restricted imprisonment for juveniles and brought improvements to the probation and remand centres systems, while the passage of the Justices of the Peace Act of 1949 led to extensive reforms of magistrates' courts. The Attlee government also abolished the marriage bar in the Civil Service, thereby enabling married women to work in that institution. In 1946, the government set up a National Institute of Houseworkers as a means of providing a social democratic variety of domestic service. By late 1946, agreed standards of training were established, which was followed by the opening of a training headquarters and the opening of an additional nine (9) training centres in Wales, Scotland, and then throughout Great Britain. The National Health Service Act of 1946 indicated that domestic help should be provided for households where that help is required "owing to the presence of any person who is ill, lying-in, an expectant mother, mentally defective, aged or a child not over compulsory school age." 'Home help' therefore included the provision of home-helps for nursing and expectant mothers and for mothers with children under the age of five, and by 1952 some 20,000 women were engaged in this service. Development rights were nationalised while the government attempted to take all development profits for the State. Strong planning authorities were set up to control land use, and issued manuals of guidance which stressed the importance of safeguarding agricultural land. A chain of regional offices was set up within its planning ministry to provide a strong lead in regional development policies. Comprehensive Development Areas (CDAs), a designation under the Town and Country Planning Act of 1947, allowed local authorities to acquire property in the designated areas using powers of compulsory purchase in order to re-plan and develop urban areas suffering from urban blight or war damage. Various measures were carried out to improve conditions in the workplace. Entitlement to sick leave was greatly extended, and sick pay schemes were introduced for local authority administrative, professional and technical workers in 1946 and for various categories of manual workers in 1948. Worker's compensation was also significantly improved. The Fair Wages Resolution of 1946 required any contractor working on a public project to at least match the pay rates and other employment conditions set in the appropriate collective agreement. In 1946, purchase tax was removed completely from kitchen fittings and crockery, while the rate was reduced on various gardening items. The Fire Services Act 1947 introduced a new pension scheme for fire-fighters, while the Electricity Act 1947 introduced better retirement benefits for workers in that industry. A Workers' Compensation (Supplementation) Act was passed in 1948 that introduced benefits for workers with certain asbestos-related diseases which had occurred before 1948. The Merchant Shipping Act of 1948 and the Merchant Shipping (Safety Convention) Act of 1949 were passed to improve conditions for seamen. The Shops Act of 1950 consolidated previous legislation which provided that no one could be employed in a shop for more than six hours without having a break for at least 20 minutes. The legislation also required a lunch break of at least 45 minutes for anyone for worked between 11:30 am and 2:30 pm and a half-hour tea break for anyone working between 4 pm and 7 pm. The government also strengthened a Fair Wages Resolution, with a clause that required all employers getting government contracts to recognise the rights of their workers to join trade unions. The Trades Disputes Act 1927 was repealed, and a Dock Labour Scheme was introduced in 1947 to put an end to the casual system of hiring labour in the docks. This scheme gave registered dockers the legal right to minimum work and decent conditions. Through the National Dock Labour Board (on which trade unions and employers had equal representation) the unions acquired control over recruitment and dismissal. Registered dockers laid off by employers within the Scheme had the right either to be taken on by another, or to generous compensation. All dockers were registered under the Dock Labour Scheme, giving them a legal right to minimum work, holidays and sick pay. Wages for members of the police force were significantly increased. The introduction of a Miner's Charter in 1946 instituted a five-day work week for miners and a standardised day wage structure, and in 1948 a Colliery Workers Supplementary Scheme was approved, providing supplementary allowances to disabled coal-workers and their dependants. In 1948, a pension scheme was set up to provide pension benefits for employees of the new NHS, as well as their dependents. Under the Coal Industry Nationalisation (Superannuation) Regulations of 1950, a pension scheme for mineworkers was established. Improvements were also made in farmworkers' wages, and the Agricultural Wages Board in 1948 not only safeguarded wage levels, but also ensured that workers were provided with accommodation. A number of regulations aimed at safeguarding the health and safety of people at work were also introduced during Attlee's time in office. Regulations issued in February 1946 applied to factories involved with "manufacturing briquettes or blocks of fuel consisting of coal, coal dust, coke or slurry with pitch as a binding substance," and concerned "dust and ventilation, washing facilities and clothing accommodation, medical supervision and examination, skin and eye protection and messrooms." Attlee's government also carried out their manifesto commitment for nationalisation of basic industries and public utilities. The Bank of England and civil aviation were nationalised in 1946. Coal mining, the railways, road haulage, canals and Cable and Wireless were nationalised in 1947, and electricity and gas followed in 1948. The steel industry was nationalised in 1951. By 1951 about 20 per cent of the British economy had been taken into public ownership. Nationalisation failed to provide workers with a greater say in the running of the industries in which they worked. It did, however, bring about significant material gains for workers in the form of higher wages, reduced working hours, and improvements in working conditions, especially in regards to safety. As historian Eric Shaw noted of the years following nationalisation, the electricity and gas supply companies became "impressive models of public enterprise" in terms of efficiency, and the National Coal Board was not only profitable, but working conditions for miners had significantly improved as well. Within a few years of nationalisation, a number of progressive measures had been carried out which did much to improve conditions in the mines, including better pay, a five-day working week, a national safety scheme (with proper standards at all the collieries), a ban on boys under the age of 16 going underground, the introduction of training for newcomers before going down to the coalface, and the making of pithead baths into a standard facility. Union leaders saw nationalisation as a means to pursue a more advantageous position within a framework of continued conflict, rather than as an opportunity to replace the old adversarial form of industrial relations. Moreover, most workers in nationalised industries exhibited an essentially instrumentalist attitude, favouring public ownership because it secured job security and improved wages rather than because it promised the creation of a new set of socialists relationships in the workplace. The Attlee government placed strong emphasis on improving the quality of life in rural areas, benefiting both farmers and other consumers. Security of tenure for farmers was introduced, while consumers were protected by food subsidies and the redistributive effects of deficiency payments. Between 1945 and 1951, the quality of rural life was improved by improvements in gas, electricity, and water services, as well as in leisure and public amenities. In addition, the 1947 Transport Act improved provision of rural bus services, while the Agriculture Act 1947 established a more generous subsidy system for farmers. Legislation was also passed in 1947 and 1948 which established a permanent Agricultural Wages Board to fix minimum wages for agricultural workers. Attlee's government made it possible for farm workers to borrow up to 90 per cent of the cost of building their own houses, and received a subsidy of £15 a year for 40 years towards that cost. Grants were also made to meet up to half the cost of supplying water to farm buildings and fields, the government met half the cost of bracken eradication and lime spreading, and grants were paid for bringing hill farming land into use that had previously been considered unfit for farming purposes. In 1946, the National Agricultural Advisory Service was set up to supply agricultural advice and information. The Hill Farming Act of 1946 introduced for upland areas a system of grants for buildings, land improvement, and infrastructural improvements such as roads and electrification. The act also continued a system of headage payments for hill sheep and cattle that had been introduced during the war. The Agricultural Holdings Act of 1948 enabled (in effect) tenant farmers to have lifelong tenancies and made provision for compensation in the event of cessations of tenancies. In addition, the Livestock Rearing Act of March 1951 extended the provisions of the 1946 Hill Farming Act to the upland store cattle and sheep sector. At a time of world food shortages, it was vital that farmers produced the maximum possible quantities. The government encouraged farmers via subsidies for modernisation, while the National Agricultural Advisory Service provided expertise and price guarantees. As a result of the Attlee government's initiatives in agriculture, there was a 20 per cent increase in output between 1947 and 1952, while Britain adopted one of the most mechanised and efficient farming industries in the world. The Attlee government ensured provisions of the Education Act 1944 were fully implemented, with free secondary education becoming a right for the first time. Fees in state grammar schools were eliminated, while new, modern secondary schools were constructed. The school leaving age was raised to 15 in 1947, an accomplishment helped brought into fruition by initiatives such as the H.O.R.S.A. ("Huts Operation for Raising the School-leaving Age") scheme and the S.F.O.R.S.A. (furniture) scheme. University scholarships were introduced to ensure that no one who was qualified “should be deprived of a university education for financial reasons,” while a large school building programme was organised. A rapid increase in the number of trained teachers took place, and the number of new school places was increased. Increased Treasury funds were made available for education, particularly for upgrading school buildings suffering from years of neglect and war damage. Prefabricated classrooms were built and 928 new primary schools were constructed between 1945 and 1950. The provision of free school meals was expanded, and opportunities for university entrants were increased. State scholarships to universities were increased, and the government adopted a policy of supplementing university scholarships awards to a level sufficient to cover fees plus maintenance. Many thousands of ex-servicemen were assisted to go through college who could never have contemplated it before the war. Free milk was also made available to all schoolchildren for the first time. In addition, spending on technical education rose, and the number of nursery schools was increased. Salaries for teachers were also improved, and funds were allocated towards improving existing schools. In 1947, the Arts Council of Great Britain was set up to encourage the arts. A Ministry of Education was established, and free County Colleges were set up for the compulsory part-time instruction of teenagers between the ages of 15 and 18 who were not in full-time education. An Emergency Training Scheme was also introduced which turned out an extra 25,000 teachers in 1945–1951. In 1947, Regional Advisory Councils were set up to bring together industry and education to find out the needs of young workers "and advise on the provision required, and to secure reasonable economy of provision." That same year, thirteen Area Training Organisations were set up in England and one in Wales to coordinate teacher training. Attlee's government, however, failed to introduce the comprehensive education for which many socialists had hoped (as a means of making the educational system based more on merit and less on hereditary privilege.) This reform was eventually carried out by Harold Wilson's government. During its time in office, the Attlee government increased spending on education by over 50 per cent, from £6.5 billion to £10 billion. The most significant problem facing Attlee and his ministers remained the economy, as the war effort had left Britain nearly bankrupt. The war had cost Britain about a quarter of her national wealth. Overseas investments had been used up to pay for the war. The transition to a peacetime economy, and the maintaining of strategic military commitments abroad led to continuous and severe problems with the balance of trade. This resulted in strict rationing of food and other essential goods continuing in the post war period to force a reduction in consumption in an effort to limit imports, boost exports, and stabilise the Pound Sterling so that Britain could trade its way out of its financial state. The abrupt end of the American Lend-Lease program in August 1945 almost caused a crisis. Some relief was provided by the Anglo-American loan, negotiated in December 1945. The conditions attached to the loan included making the pound fully convertible to the US dollar. When this was introduced in July 1947, it led to a currency crisis and convertibility had to be suspended after just five weeks. The UK benefited from the American Marshall Aid program in 1948, and the economic situation improved significantly. Another balance of payments crisis in 1949 forced Chancellor of the Exchequer, Stafford Cripps, into devaluation of the pound. Despite these problems, one of the main achievements of Attlee's government was the maintenance of near full employment. The government maintained most of the wartime controls over the economy, including control over the allocation of materials and manpower, and unemployment rarely rose above 500,000, or 3 per cent of the total workforce. Labour shortages proved a more frequent problem. The inflation rate was also kept low during his term. 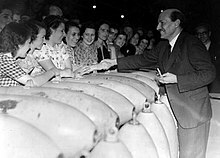 The rate of unemployment rarely rose above 2 per cent during Attlee's time in office, whilst there was no hard-core of long-term unemployed. Both production and productivity rose as a result of new equipment, while the average working week was shortened. The government was less successful in housing, which was the responsibility of Aneurin Bevan. The government had a target to build 400,000 new houses a year to replace those which had been destroyed in the war, but shortages of materials and manpower meant that less than half this number were built. Nevertheless, millions of people were rehoused as a result of the Attlee government's housing policies. Between August 1945 and December 1951, 1,016,349 new homes were completed in England, Scotland, and Wales. When the Attlee government was voted out of office in 1951, the economy had been improved compared to 1945. The period from 1946 to 1951 saw continuous full employment and steadily rising living standards, which increased by about 10 per cent each year. During that same period, the economy grew by 3 per cent a year, and by 1951 the UK had "the best economic performance in Europe, while output per person was increasing faster than in the United States." Careful planning after 1945 also ensured that demobilisation was carried out without having a negative impact upon economic recovery, and that unemployment stayed at very low levels. In addition, the number of motor cars on the roads rose from 3 million to 5 million from 1945 to 1951, and seaside holidays were taken by far more people than ever before. A Monopolies and Restrictive Practices (Inquiry and Control) Act was passed in 1948, which allowed for investigations of restrictive practices and monopolies. 1947 proved a particularly difficult year for the government; an exceptionally cold winter that year caused coal mines to freeze and cease production, creating widespread power cuts and food shortages. The Minister of Fuel and Power, Emanuel Shinwell was widely blamed for failing to ensure adequate coal stocks, and soon resigned from his post. The Conservatives capitalised on the crisis with the slogan 'Starve with Strachey and shiver with Shinwell' (referring to the Minister of Food John Strachey). The crisis led to an unsuccessful plot by Hugh Dalton to replace Attlee as Prime Minister with Ernest Bevin. Later that year Stafford Cripps tried to persuade Attlee to stand aside for Bevin. These plots petered out after Bevin refused to cooperate. Later that year, Hugh Dalton resigned as Chancellor after inadvertently leaking details of the budget to a journalist. He was replaced by Cripps. 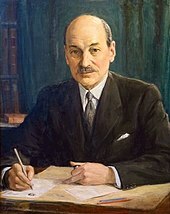 In foreign affairs, the Attlee government was concerned with four main issues; post-war Europe, the onset of the Cold War, the establishment of the United Nations, and decolonisation. The first two were closely related, and Attlee was assisted by Foreign Secretary Ernest Bevin. 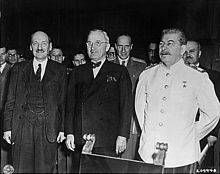 Attlee also attended the later stages of the Potsdam Conference, where he negotiated with President Harry S. Truman and Joseph Stalin. In the immediate aftermath of the war, the Government faced the challenge of managing relations with Britain's former war-time ally, Stalin and the Soviet Union. Ernest Bevin was a passionate anti-communist, based largely on his experience of fighting communist influence in the trade union movement. Bevin's initial approach to the USSR as Foreign Secretary was "wary and suspicious, but not automatically hostile." Attlee himself sought warm relations with Stalin. He put his trust in the United Nations, rejected notions that the Soviet Union was bent on world conquest, and warned that treating Moscow as an enemy would turn it into one. This put Attlee at sword's point with his foreign minister, the Foreign Office, and the military who all saw the Soviets as a growing threat to Britain's role in the Middle East. Suddenly in January 1947, Attlee reversed his position and agreed with Bevin on a hard-line anti-Soviet policy. In an early "good-will" gesture that was later heavily criticised, the Attlee government allowed the Soviets to purchase, under the terms of a 1946 UK-USSR Trade Agreement, a total of 25 Rolls-Royce Nene jet engines in September 1947 and March 1948. The agreement included an agreement not to use them for military purposes. The price was fixed under a commercial contract; a total of 55 jet engines were sold to the USSR in 1947. However, the Cold War intensified during this period and the Soviets, who at the time were well behind the West in jet technology, reverse-engineered the Nene and installed their own version in the MiG-15 interceptor. This was used to good effect against US-UK forces in the subsequent Korean War, as well as in several later MiG models. After Stalin took political control of most of Eastern Europe, and began to subvert other governments in the Balkans, Attlee's and Bevin's worst fears of Soviet intentions were realised. The Attlee government then became instrumental in the creation of the successful NATO defence alliance to protect Western Europe against any Soviet expansion. In a crucial contribution to the economic stability of post-war Europe, Attlee's Cabinet was instrumental in promoting the American Marshall Plan for the economic recovery of Europe. He called it, one of the "most bold, enlightened and good-natured acts in the history of nations." A group of Labour MPs, organised under the banner of "Keep Left" urged the government to steer a middle way between the two emerging superpowers, and advocated the creation of a "third force" of European powers to stand between the US and USSR. However, deteriorating relations between Britain and the USSR, as well as Britain's economic reliance on America following the Marshall Plan, steered policy towards supporting the US. In January 1947, fear of both Soviet and American nuclear intentions led to a secret meeting of the Cabinet, where the decision was made to press ahead with the development of Britain's independent nuclear deterrent, an issue which later caused a split in the Labour Party. Britain's first successful nuclear test, however, did not occur until 1952, one year after Attlee had left office. The London dock strike of July 1949, led by Communists, was suppressed when the Attlee government sent in 13,000 Army troops and passed special legislation to promptly end the strike. His response reveals Attlee's growing concern that Soviet expansionism, supported by the British Communist Party, was a genuine threat to national security, and that the docks were highly vulnerable to sabotage ordered by Moscow. He noted that the strike was caused not by local grievances, but to help communist unions who were on strike in Canada. Attlee agreed with MI5 that he faced "a very present menace." Decolonisation was never a major election issue but Attlee gave the matter a great deal of attention and was the chief leader in planning and achieving the process of decolonisation of the British Empire, starting in Asia. Attlee orchestrated the granting of independence to India and Pakistan in 1947. Attlee in 1928–1934 had been a member of the Indian Statutory Commission, called the Simon Commission. He became the Labour Party expert on India and by 1934 was committed to granting India the same independent dominion status that Canada and Australia recently were given. He faced strong resistance from the die-hard Conservative imperialists, led by Churchill, who opposed both independence and efforts led by Prime Minister Stanley Baldwin to set up a system of limited local control by Indians themselves. Attlee and the Labour leadership were sympathetic to the Congress movement led by Mahatma Gandhi and Jawaharlal Nehru. 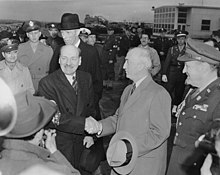 During the Second World War Attlee was in charge of Indian affairs. He set up the Cripps Mission in 1942, which tried and failed to bring the factions together. When the Congress called for passive resistance in the "Quit India" movement of 1942–1945, it was Attlee who ordered the arrest and internment for the duration of tens of thousands of Congress leaders and crushed the revolt. Labour's election Manifesto in 1945 called for "the advancement of India to responsible self-government," but did not mention independence. In 1942 the British Raj tried to enlist all major political factors parties in support of the war effort. Congress, led by Nehru and Gandhi, demanded immediate independence and full control by Congress of all of India. That demand was rejected by the British, and Congress opposed the war effort with its "Quit India campaign". The Raj immediately responded in 1942 by imprisoning the major national, regional and local Congress leaders for the duration. Attlee did not object. By contrast, the Muslim League led by Muhammad Ali Jinnah, and also the Sikh community, strongly supported the war effort. They greatly enlarged their membership and won favour from London for their decision. Attlee retained a fondness for Congress and until 1946, accepted their thesis that they were a non-religious party that accepted Hindus, Muslims, Sikhs, and everyone else. The Muslim league insisted that it was the only true representative of all of the Muslims of India, and by 1946 Attlee had come to agree with them. With violence escalating in India after the war, but with British financial power at a low ebb, large-scale military involvement was impossible. Viceroy Wavell said he needed a further seven army divisions to prevent communal violence if independence negotiations failed. No divisions were available; independence was the only option. Given the demands of the Muslim league, independence implied a partition that set off heavily Muslim Pakistan from the main portion of India. The Labour government gave independence to India and Pakistan in an unexpectedly quick move in 1947. Historian Andrew Roberts says the independence of India was a "national humiliation" but it was necessitated by urgent financial, administrative, strategic and political needs. Churchill in 1940–1945 had tightened the hold on India and imprisoned the Congress leadership, with Attlee's approval. Labour had looked forward to making it a fully independent dominion like Canada or Australia. Many of the Congress leaders in the India had studied in England, and were highly regarded as fellow idealistic socialists by Labour leaders. Attlee was the Labour expert on India and took special charge of decolonisation. Attlee found that Churchill's viceroy, Field Marshal Wavell, was too imperialistic, too keen on military solutions (he wanted seven more Army divisions) and too neglectful of Indian political alignments. The new Viceroy was Lord Mountbatten, the dashing war hero and a cousin of the King. The boundary between the newly created states of Pakistan and India involved the widespread resettlement of millions of Muslims and Hindus (and many Sikhs). Extreme violence ensued when Punjab and Bengal provinces were split. Historian Yasmin Khan estimates that between a half-million and a million men, women and children were killed. Gandhi himself was assassinated by a Hindu activist in January 1948. The final result was two nations consisting of a Hindu-majority India and a Muslim-majority Pakistan (which incorporated East Pakistan, now Bangladesh). Both joined the Commonwealth. Attlee also sponsored the peaceful transition to independence in 1948 of Burma (Myanmar) and Ceylon (Sri Lanka). One of the most urgent problems concerned the future of the Palestine Mandate. It had become too troublesome and much too expensive to handle. 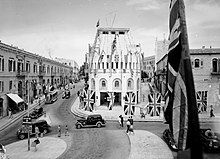 British policies there were perceived by the Zionist movement and the Truman Administration as pro-Arab and anti-Jewish. In the face of an armed revolt of Jewish militant groups and increasing violence of the local Arab population, Britain had found itself unable to control events. This was a very unpopular commitment, and the evacuation of British troops and subsequent handing over of the issue to the United Nations was widely supported by the British public. The government's policies with regard to the other colonies, particularly those in Africa, focused on keeping them as strategic Cold War assets while modernising their economies. The Labour Party had long attracted aspiring leaders from Africa and had developed elaborate plans before the war. Implementing them overnight with an empty treasury proved too challenging. A major military base was built in Kenya, and the African colonies came under an unprecedented degree of direct control from London. Development schemes were implemented to help solve Britain's post-war balance of payments crisis and raise African living standards. This "new colonialism" worked slowly and had failures such as the Tanganyika groundnut scheme. The 1950 election gave Labour a massively reduced majority of five seats compared to the triple-digit majority of 1945. Although re-elected, the result was seen by Attlee as very disappointing, and was widely attributed to the effects of post-war austerity denting Labour's appeal to middle-class voters. With such a small majority leaving him dependent on a small number of MPs to govern, Attlee's second term was much tamer than his first. Some major reforms were nevertheless passed, particularly regarding industry in urban areas and regulations to limit air and water pollution. By 1951, the Attlee government was exhausted, with several of its most senior ministers ailing or ageing, and with a lack of new ideas. Attlee's record for settling internal differences in the Labour Party fell in April 1951, when there was a damaging split over an austerity Budget brought in by the Chancellor, Hugh Gaitskell, to pay for the cost of Britain's participation in the Korean War. Aneurin Bevan resigned to protest against the new charges for "teeth and spectacles" in the National Health Service introduced by that Budget, and was joined in this action by several senior ministers, including the future Prime Minister Harold Wilson, then the President of the Board of Trade. Thus escalated a battle between the left and right wings of the Party that continues today. Finding it increasingly impossible to govern, Attlee's only chance was to call a snap election in October 1951, in the hope of achieving a more workable majority and to regain authority. The gamble failed: Labour narrowly lost to the Conservative Party, despite winning considerably more votes (achieving the largest Labour vote in electoral history). Attlee tendered his resignation as Prime Minister the following day, after six years and three months in office. Following the defeat in 1951, Attlee continued to lead the party as Leader of the Opposition. His last four years as leader were, however, widely seen as one of the Labour Party's weaker periods. The period was dominated by infighting between the Labour Party's right wing, led by Hugh Gaitskell, and its left, led by Aneurin Bevan. Many Labour MPs felt that Attlee should have retired after the 1951 election and allowed a younger man to lead the party. Bevan openly called for him to stand down in the summer of 1954. One of his main reasons for staying on as leader was to frustrate the leadership ambitions of Herbert Morrison, whom Attlee disliked for both political and personal reasons. At one time, Attlee had favoured Aneurin Bevan to succeed him as leader, but this became problematic after Bevan almost irrevocably split the party. Labour has nothing to gain by dwelling in the past. Nor do I think we can impress the nation by adopting a futile left-wingism. I regard myself as Left of Centre which is where a Party Leader ought to be. It is no use asking, 'What would Keir Hardie have done?' We must have at the top men brought up in the present age, not, as I was, in the Victorian Age. Attlee, now aged 72, contested the 1955 general election against Anthony Eden, which saw Labour lose 18 seats, and the Conservatives increase their majority. He retired as Leader of the Labour Party on 7 December 1955, having led the party for twenty years, and on 14 December Hugh Gaitskell was elected as his replacement. He subsequently retired from the House of Commons and was elevated to the peerage to take his seat in the House of Lords as Earl Attlee and Viscount Prestwood on 16 December 1955. He believed Eden had been forced into taking a strong stand on the Suez Crisis by his backbenchers. In 1958, he was, along with numerous notables, to establish the Homosexual Law Reform Society. The society campaigned for the decriminalisation of homosexual acts in private by consenting adults, a reform which was voted through Parliament nine years later. In 1962, he spoke twice in the House of Lords against the British government's application for the UK to join the European Economic Community ("Common Market"). In his second speech delivered in November, Attlee claimed that Britain had a separate parliamentary tradition from the Continental countries that composed the EEC. He also claimed that if Britain was a member, EEC rules would prevent the British government from planning the economy and that Britain's traditional policy had been outward looking rather than Continental. 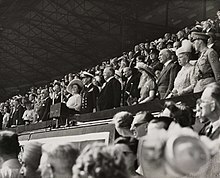 He attended Winston Churchill's funeral in January 1965. He was elderly and frail by that time, and had to remain seated in the freezing cold as the coffin was carried, having tired himself out by standing at the rehearsal the previous day. He lived to see the Labour Party return to power under Harold Wilson in 1964, but also to see his old constituency of Walthamstow West fall to the Conservatives in a by-election in September 1967. Attlee died peacefully in his sleep of pneumonia, at the age of 84 at Westminster Hospital on 8 October 1967. Two thousand people attended his funeral in November, including the then-Prime Minister Harold Wilson and the Duke of Kent, representing the Queen. He was cremated and his ashes were buried at Westminster Abbey. Upon his death, the title passed to his son Martin Richard Attlee, 2nd Earl Attlee (1927–1991). It is now held by Clement Attlee's grandson John Richard Attlee, 3rd Earl Attlee. The third earl (a member of the Conservative Party) retained his seat in the Lords as one of the hereditary peers to remain under an amendment to Labour's 1999 House of Lords Act. Attlee's estate was sworn for probate purposes at a value of £7,295, a relatively modest sum for so prominent a figure, and only a fraction of the £75,394 in his father's estate when he died in 1908. The quotation about Attlee, "A modest man, but then he has so much to be modest about", is commonly ascribed to Churchill—though Churchill denied saying it, and respected Attlee's service in the War Cabinet. Attlee's modesty and quiet manner hid a great deal that has only come to light with historical reappraisal. In terms of the machinery of government, he was one of the most businesslike and effective of all the UK Prime Ministers. The journalist and broadcaster Anthony Howard called him "the greatest Prime Minister of the 20th century." His leadership style of consensual government, acting as a chairman rather than a president, won him much praise from historians and politicians alike. Christopher Soames, the British Ambassador to France during the Conservative government of Edward Heath and cabinet minister under Margaret Thatcher, remarked that "Mrs Thatcher was not really running a team. Every time you have a Prime Minister who wants to make all the decisions, it mainly leads to bad results. Attlee didn't. That's why he was so damn good." Thatcher herself wrote in her 1995 memoirs, which charted her beginnings in Grantham to her victory at the 1979 general election, that she admired Attlee, writing: "Of Clement Attlee, however, I was an admirer. He was a serious man and a patriot. Quite contrary to the general tendency of politicians in the 1990s, he was all substance and no show." Attlee's government presided over the successful transition from a wartime economy to peacetime, tackling problems of demobilisation, shortages of foreign currency, and adverse deficits in trade balances and government expenditure. Further domestic policies that he brought about included the creation of the National Health Service and the post-war Welfare State, which became key to the reconstruction of post-war Britain. Attlee and his ministers did much to transform the UK into a more prosperous and egalitarian society during their time in office with reductions in poverty and a rise in the general economic security of the population. In foreign affairs, he did much to assist with the post-war economic recovery of Europe. He proved a loyal ally of the United States at the onset of the Cold War. Due to his style of leadership, it was not he, but Ernest Bevin who masterminded foreign policy. It was Attlee's government that decided Britain should have an independent nuclear weapons programme, and work on it began in 1947. Bevin, Attlee's Foreign Secretary, famously stated that "We've got to have it and it's got to have a bloody Union Jack on it." The first operational British A Bomb was not detonated until October 1952, about one year after Attlee had left office. Independent British atomic research was prompted partly by the US McMahon Act, which nullified wartime expectations of postwar US–UK collaboration in nuclear research, and prohibited Americans from communicating nuclear technology even to allied countries. British atomic bomb research was kept secret even from some members of Attlee's own cabinet, whose loyalty or discretion seemed uncertain. Although a socialist, Attlee still believed in the British Empire of his youth. He thought of it as an institution that was a power for good in the world. Nevertheless, he saw that a large part of it needed to be self-governing. Using the Dominions of Canada, Australia, and New Zealand as a model, he continued the transformation of the empire into the modern-day British Commonwealth. His greatest achievement, surpassing many of these, was perhaps the establishment of a political and economic consensus about the governance of Britain that all three major parties subscribed to for three decades, fixing the arena of political discourse until the late-1970s. In 2004, he was voted the most successful British Prime Minister of the 20th century by a poll of 139 academics organised by Ipsos MORI. Several years after his death, a street on a new housing development in Tividale, West Midlands, was named Attlee Close in his memory. The Birks Holt social housing estate in Maltby, South Yorkshire, has its streets named after Labour politicians, including Attlee, Sir Stafford Cripps, Hugh Gaitskell, and George Lansbury. 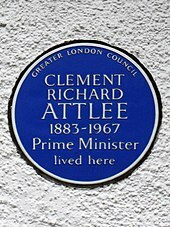 A blue plaque unveiled in 1979 commemorates Attlee at 17 Monkhams Avenue, in Woodford Green in the London borough of Redbridge. Attlee was elected a Fellow of the Royal Society in 1947. Attlee was awarded an Honorary Fellowship of Queen Mary College on 15 December 1948. 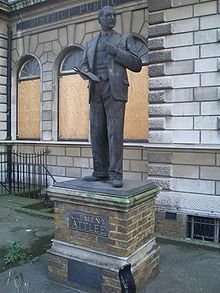 On 30 November 1988, a bronze statue of Clement Attlee was unveiled by Harold Wilson (the next Labour Prime Minister after Attlee) outside Limehouse Library in Attlee's former constituency. By then Wilson was the last surviving member of Attlee's cabinet, and the unveiling of the statue would be one of the last public appearances by Wilson, who was by that point in the early stages of Alzheimer's Disease; he died at the age of 79 in May 1995. Limehouse Library was closed in 2003, after which the statue was vandalised. The council surrounded it with protective hoarding for four years, before eventually removing it for repair and recasting in 2009. 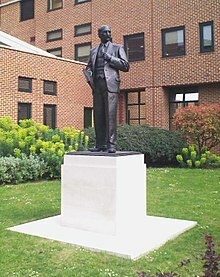 In April 2011 the restored statue was unveiled by Peter Mandelson in its new position less than a mile away at the Queen Mary University of London's Mile End campus. There is also a statue of Clement Attlee in the Houses of Parliament that was erected, instead of a bust, by parliamentary vote in 1979. The sculptor was Ivor Roberts-Jones. Although one of his brothers became a clergyman and one of his sisters a missionary, Attlee himself is usually regarded as an agnostic. In an interview he described himself as "incapable of religious feeling", saying that he believed in "the ethics of Christianity" but not "the mumbo-jumbo." When asked whether he was an agnostic, Attlee replied "I don't know." ^ "British Labour Party election manifesto, 1945 [archived]". Retrieved 9 January 2016. ^ Pearce 1997, p. 2. ^ Davies, Edward J. "The Ancestry of Clement Attlee", Genealogists' Magazine, 31(2013–15): 380–87. ^ Beckett 1998, p. 17. ^ Beckett 1998, pp. 18–35. ^ Beckett 1998, pp. 34–43. ^ Beckett 1998, pp. 43–45, 52. ^ Beckett 1998, pp. 47–50. ^ Beckett 1998, p. 46. ^ Beckett 1998, pp. 50–51. ^ The National Archive WO 95/101 War History of 10th Battalion, Tank Corps, pp. 1–2. ^ Beckett 1998, pp. 55–58. ^ Bew, Clement Attlee pp 115–18. ^ "Janet Helen Attlee Shipton – Obituaries – Standard Examiner". ^ "Janet Attlee's wedding 1947". British Pathe. ^ "Felicity Attlee weds 1955". British Pathe. ^ "DAVIS – Deaths Announcements – Telegraph Announcements". ^ "Mr. Attlee's Daughter Weds – Alison Attlee… 1952". British Pathe. Retrieved 25 March 2016. ^ Beckett 1998, pp. 62–63. ^ The Social Worker Attlee (pg. 30), archive.org; accessed 25 March 2016. ^ The Social Worker Attlee (pg. 75), archive.org; accessed 25 March 2016. ^ Beckett 1998, p. 122. ^ a b c d e f Howell, David. (2006) Attlee (20 British Prime Ministers of the 20th Century), Haus Publishing; ISBN 1-904950-64-7. ^ Rennie, John. "Lansbury v Morrison, the battle over Poplarism". 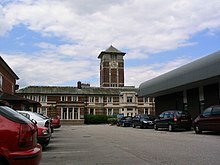 eastlondonhistory.com. Retrieved 28 July 2017. ^ Beckett 1998, pp. 74–77. ^ Beckett 1998, pp. 80–82. ^ Beckett 1998, pp. 83–91. ^ Brasted Howard, Bridge Carl (1988). "The British Labour Party and Indian Nationalism, 1907‐1947". South Asia: Journal of South Asian Studies. 11 (2): 69–99. doi:10.1080/00856408808723113. ^ Beckett 1998, pp. 96–99. ^ Beckett 1998, pp. 101–102. ^ Contains excerpt from Attlee's biography towards the bottom of the page; accessed 26 July 2017. ^ Beckett 1998, pp. 104–105. ^ Beckett 1998, pp. 108–109. ^ Beckett 1998, pp. 112–113. ^ Attlee, Clement (18 February 1952). "Tribute from Labor's Attlee to George and the monarchy". Life. Vol. 32 no. 7. It was my privilege for six years to serve King George as First Minister of the Crown and for five years during the war as Deputy Prime Minister. The longer I served him the greater was my respect and admiration for him. I can never forget his kindness and consideration to me. He had a great sense of duty, high courage, good judgment and warm human sympathy. He was in the fullest sense of the term a good man. ^ Bew (2017). Clement Attlee. pp. 23, 173–188, 208. ^ Beckett 1998, pp. 116–117. ^ Thomas-Symonds 2012, pp. 68–70. ^ Beckett 1998, pp. 121–130. ^ Rhiannon Vickers (2013). The Labour Party and the World, Volume 1: The Evolution of Labour's Foreign Policy, 1900–51. Manchester UP. p. 92. ^ Talus, Your Alternative Government (London: Eyre and Spottiswoode, 1945), p. 17. ^ "Defence". 299 cc35-174. Commons and Lords Hansard. 11 March 1935. Retrieved 20 March 2013. ^ "Defence Policy". 302 cc359-486. Commons and Lords Hansard. 22 May 1935. Retrieved 20 March 2013. ^ "Mr. Attlee on a war budget", The Times, 23 April 1936, p. 16. ^ "MR. DUFF COOPER'S SPEECH". Retrieved 9 January 2016. ^ Beckett 1998, pp. 131–134. ^ "Prime Minister's Statement". Commons and Lords Hansard. 3 October 1938. Retrieved 20 March 2013. ^ Beckett 1998, pp. 134–135. ^ Beckett 1998, pp. 140–141. ^ Syal, Rajeev (20 November 2018). "Clement Attlee took in Jewish child refugee who fled Nazis". The Guardian. Retrieved 20 November 2018. ^ "The Norway Campaign in World War Two". BBC. 30 March 2011. Retrieved 2 October 2011. ^ Beckett 1998, pp. 157–158. ^ Beckett 1998, pp. 163–164. ^ Beckett 1998, p. 164. ^ Crowcroft, Robert. "Clement Attlee: enigmatic, out of time – and formidable". Gov.uk. Retrieved 3 August 2017. ^ Quoted by Paul Addison in V. Bogdanor (2016). From New Jerusalem to New Labour: British Prime Ministers from Attlee to Blair. p. 9. ^ Steven Fielding, "What did ‘the people’want? : the meaning of the 1945 general election." Historical Journal 35#3 (1992): 623–639. ^ a b c Addison, Dr Paul. "Why Churchill Lost in 1945". BBC History. Retrieved 9 August 2017. ^ The Manchester Guardian 4 July 1945. ^ Kynaston, David (2008). Austerity Britain 1945–51. London: Bloomsbury Publishing. pp. 70–71. ISBN 978-0-7475-9923-4. ^ a b R. C. Whiting, "Attlee, Clement Richard, first Earl Attlee (1883–1967)", Oxford Dictionary of National Biography, 2004. ^ "VOTE2001 – THE ELECTION BATTLES 1945–1997". BBC News. ^ Kynaston, David (2010). Austerity Britain, 1945–1951. Bloomsbury Publishing. p. 75. ISBN 9780802779588. ^ Rachel Reeves, and Martin McIvor. "Clement Attlee and the foundations of the British welfare state." Renewal: a Journal of Labour Politics 22#3/4 (2014): 42. ^ Francis, Martin. "Economics and Ethics: The Nature of Labour's Socialism, 1945–1951", Twentieth Century British History (1995) 6#2, pp 220–43. ^ Alec Cairncross (2013). Years of Recovery: British Economic Policy 1945–51. p. 49. ^ a b c Jefferys, Kevin. The Attlee Governments, 1945–1951. ^ "HC S Budget Resolution and Economic Situation". Margaret Thatcher Foundation. 5 May 1966. Retrieved 20 March 2013. ^ a b Harmer, Harry. The Longman Companion to The Labour Party 1900–1998. ^ a b c Pritt, Denis Nowell. The Labour Government 1945–51. ^ Miller, George (1 January 2000). On Fairness and Efficiency: The Privatisation of the Public Income Over the Past Millennium. Bristol, UK: The Policy Press. p. 172. ISBN 9781861342218. Retrieved 21 July 2012. ^ Socially Deprived Families in Britain (edited by Robert Holman), first published in 1970 (reprinted edition 1971). ^ "Who, What, Why: Why do the rich get child benefit?". BBC News. 4 October 2010. ^ "An Assessment of the Attlee Government". Google. Retrieved 21 July 2012. ^ Waltman, Jerold L. (2004). The Case for the Living Wage. Algore Publishing. p. 199. ISBN 9780875863023. Retrieved 21 July 2012. ^ J.P. Lawton (April 1950). "Married Women (Maintenance) Act, 1949". The Modern Law Review. Wiley. 13 (2): 220–222. JSTOR 1089590. ^ "Mulberry". Learningeye.net. 9 October 2004. Retrieved 21 July 2012. ^ Hollowell, J. (2008). Britain Since 1945. Wiley. p. 180. ISBN 9780470758175. Retrieved 5 October 2014. ^ a b c d Francis, Martin. Ideas and Policies Under Labour, 1945–1951. ^ "The Women's Library Special Collections Catalogue". Calmarchive.londonmet.ac.uk. 9 July 1952. Archived from the original on 19 April 2013. Retrieved 20 March 2013. ^ Labour and Inequality: Sixteen Fabian Essays (edited by Peter Townsend and Nicholas Bosanquet). ^ Squires, Graham (21 August 2012). "Urban and Environmental Economics: An Introduction". ISBN 9781136791000. ^ Townsend, Peter. Poverty in the United Kingdom: A Survey of Household Resources and Standards of Living. ^ Hicks, Alexander M. Social Democracy & Welfare Capitalism: A Century of Income Security Politics. ^ Beaumont, Phil B. (1987). The Decline of Trade Union Organisation. Croom Helm. ISBN 9780709939580. Retrieved 20 March 2013. ^ Asplund, Rita, ed. (1998). Flexibility in the Nordic Labour Market. Nordic Council of Ministers. p. 119. ISBN 9789289302579. Retrieved 20 March 2013. ^ "Google Drive Viewer". Google. 5 December 2008. Retrieved 20 March 2013. ^ "MIDLANDS ELECTRICITY BOARD (WORKERS' PENSION SCHEME) (Hansard, 21 November 1957)". Hansard.millbanksystems.com. 21 November 1957. Retrieved 21 July 2012. ^ "DWP IIAC Cm 6553 1805" (PDF). July 2005. Retrieved 20 March 2013. ^ "Working Time Directive" (PDF). 19 November 1996. Retrieved 20 March 2013. ^ Fraser, W. Hamish. A History of British Trade Unionism, 1700–1998. ^ "DOCK WORKERS (PENSIONS) BILL (Hansard, 11 May 1960)". Hansard.millbanksystems.com. 11 May 1960. Retrieved 2 October 2011. ^ Harrison, Brian (26 March 2009). Seeking a Role: The United Kingdom 1951–1970. Oxford, UK: Oxford University Press. ISBN 9780191606786. Retrieved 20 March 2013. ^ "Ken Loach's film – The Spirit Of '45 – How We Did it". thespiritof45.com. Archived from the original on 5 November 2013. Retrieved 5 October 2014. ^ "POLICE PENSIONS REGULATIONS (Hansard, 29 June 1949)". Hansard.millbanksystems.com. 29 June 1949. Retrieved 21 July 2012. ^ a b c d Morgan 1984. ^ "HC S National Insurance (Colliery Workers)". Margaret Thatcher Foundation. 15 March 1965. Retrieved 21 July 2012. ^ Eggar, Tim (22 November 1994). "The Industry-Wide Mineworkers' Pension Scheme Regulations 1994". Legislation.gov.uk. Retrieved 21 July 2012. ^ a b Fifty Facts for Labour, published by the Labour Party, Transport House, Smith Square, London, SW1, October 1951. ^ "Labour's rural legacy under threat". 29 April 2013. Retrieved 9 January 2016. ^ Pelling, Henry. The Labour Governments, 1945–51. ^ Cawood, Ian. Britain in the Twentieth Century. ^ a b Shaw, Eric. The Labour Party since 1945. ^ Kynaston, David. Austerity Britain 1945–1951. ^ "The Labour Government 1945–51 – The Welfare State: Revision, Page 11". bbc.co.uk. Retrieved 25 March 2016. ^ "The Cabinet Papers | Farming and the Agriculture Acts". Nationalarchives.gov.uk. Retrieved 2 October 2011. ^ Self, Peter & Herbert J. Storing. The State and the Farmer. ^ Alston, J.M. ; P.G. Pardey; V.H. Smith (1999). Paying for agricultural productivity. International Food Policy Research Institute. p. 181. ISBN 9780801861857. Retrieved 5 October 2014. ^ "Livestock Rearing Act 1951 (c. 18)". legislation.data.gov.uk. Retrieved 5 October 2014. ^ Midmore, P.; R. J. Moore-Colyer (2006). Cherished Heartland: Future of the Uplands in Wales. Institute of Welsh Affairs. ISBN 9781904773061. Retrieved 5 October 2014. ^ Hopkins, Eric. Industrialisation and Society: A Social History, 1830–1951. ^ a b "Next steps in education". Retrieved 9 January 2016. ^ "Education Policy". Retrieved 9 January 2016. ^ "The Home Front in Britain". Retrieved 9 January 2016. ^ a b Jefferys, Kevin. The Labour Party since 1945. ^ Hartley, Cathy. A Historical Dictionary of British Women. ^ Pelling, Henry & Alastair J. Reid. A Short History of the Labour Party. ^ Oddy, Derek J. From Plain Fare to Fusion Food: British Diet from the 1890s to the 1990s. ^ Tomlinson, Jim (1997). Democratic Socialism and Economic Policy: The Attlee Years, 1945–1951. Cambridge, UK: Cambridge University Press. p. 244. ISBN 9780521892599. Retrieved 21 July 2012. ^ Smith, D. (2013). Freedom and Faith: A Question of Scottish Identity. St. Andrew Press, Ltd. p. 54. ISBN 9780861538133. Retrieved 5 October 2014. ^ Hodge, B. & W. L. Mellor. Higher School Certificate History. ^ "Powered by Google Docs". Google. Retrieved 2 October 2011. ^ Gillard, Derek. "Education in England – Timeline". educationengland.org.uk. Retrieved 5 October 2014. ^ Beech & Lee 2008. ^ Thompson, David. England in the Twentieth Century (1914–63). ^ "Pension and Widows' and Orphans' Funds". Retrieved 9 January 2016. ^ Sandbrook, Dominic (9 January 2010). "Winter of 1947". Jubileeriver.co.uk. Retrieved 20 March 2013. ^ Michael Foot (2011). Aneurin Bevan: A Biography: Volume 2: 1945–1960. Faber & Faber. p. 75. ^ Smith Raymond, Zametica John (1985). "The Cold Warrior: Clement Attlee reconsidered, 1945–7". International Affairs. 61 (2): 237–52. doi:10.2307/2617482. ^ Gordon, Yefim. Mikoyan–Gurevich MIG-15: The Soviet Union's Long-Lived Korean War Fighter, Midland Press (2001), ISBN 978-1857801057. ^ Morgan 1984, ch. 6; Thomas-Symonds 2012, pp. 2–4, 127. ^ Frank Field (2009). Attlee's Great Contemporaries: The Politics of Character. Bloomsbury. p. 38. ^ Deery Phillip (1998). "'A Very Present Menace'? Attlee, Communism and the Cold War". Australian Journal of Politics and History. 44 (1): 69–93. doi:10.1111/1467-8497.00005. ^ David Wilsford (1995). Political Leaders of Contemporary Western Europe: A Biographical Dictionary. p. 21. ^ Nicholas Owen, "Attlee governments: The end of empire 1945–51." Contemporary British History 3#4 (1990): 12–16. ^ John Bew (2017). Clement Attlee: The Man Who Made Modern Britain. Oxford UP. pp. 186–187. ISBN 978-0-19-020340-5. ^ Arthur Herman, Gandhi & Churchill: The Epic Rivalry that Destroyed an Empire and Forged Our Age (2008) pp 321–25. ^ Robert Pearce (2006). Attlee's Labour Governments 1945–51. Routledge. pp. 94–95. ^ Bew, Clement Attlee (2017) p 433. ^ F.W.S. Craig, ed., British General Election Manifestos: 1918–1966 (1970) p 105. ^ Herman, Gandhi & Churchill (2008) p 486-95. ^ Harris, Attlee (1982) pp 367–69. ^ Andrew Roberts, Eminent Churchillians (1994) p 78. ^ Kenneth Harris, Attlee (1982) pp 362–387. ^ Irial Glynn, "‘An Untouchable in the Presence of Brahmins’ Lord Wavell's Disastrous Relationship with Whitehall During His Time as Viceroy to India, 1943–7." Modern Asian Studies 41#3 (2007): 639–663. ^ Moore R. J. (1981). "Mountbatten, India, and the Commonwealth". Journal of Commonwealth & Comparative Politics. 19 (1): 5–43. doi:10.1080/14662048108447372. ^ Yasmin Khan, The Great Partition: The Making of India and Pakistan (Yale UP, 2005) pp 6, 83–103, 211. ^ Peter Lyon (2008). Conflict Between India and Pakistan: An Encyclopedia. ABC-CLIO. p. 19. ^ Paul H. Kratoska (2001). South East Asia, Colonial History: Peaceful transitions to independence (1945–1963). Taylor & Francis. ^ Ellen Jenny Ravndal, "Exit Britain: British Withdrawal From the Palestine Mandate in the Early Cold War, 1947–1948." Diplomacy & Statecraft 21#3 (2010): 416–433. ^ Kelemen Paul (2007). "Planning for Africa: The British Labour Party's Colonial Development Policy, 1920–1964". Journal of Agrarian Change. 7 (1): 76–98. doi:10.1111/j.1471-0366.2007.00140.x. ^ Hyam Ronald (1988). "Africa and the Labour government, 1945–1951". Journal of Imperial and Commonwealth History. 16 (3): 148–172. ^ "1950: Labour majority slashed". BBC News. 5 April 2005. ^ Morgan 1984, pp. 409–461. ^ H.G. Nicholas, The British general election of 1950 (1999). ^ Morgan 1984, p. 460. ^ Robert Leach; et al. (2011). British Politics. Palgrave Macmillan. p. 129. ^ Robert Crowcroft and Kevin Theakston. "The Fall of the Attlee Government, 1951." in Timothy Heppell and Kevin Theakston, eds. How Labour Governments Fall (Palgrave Macmillan, 2013). pp 61–82. ^ a b Beckett 1998. ^ Brian Harrison (2009). Seeking a Role: The United Kingdom 1951—1970. p. 166. ^ Speech in the House of Lords on the British application to join the Common Market (8 November 1962). ^ "Prime ministers' funerals from Pitt to Heath". BBC. Retrieved 4 September 2016. ^ "Clement Attlee". Find a Grave. Retrieved 13 February 2017. ^ "Earl Attlee's Remains Interred Aka Service Of Memorial And Burial For Earl Attlee (1967)". Youtube. British Pathe. Retrieved 18 July 2017. ^ Anthony Howard - Clement Attlee: the greatest Prime Minister of 20th century (20/41), video on YouTube. ^ "Clement Attlee (excerpts from M, Thatcher in primary sources section towards bottom)". spartacus educational. Retrieved 2 August 2017. ^ Tanner, Duncan; Pat Thane & Nick Tiratsoo. Labour's First Century. ^ Peter Hennessy, Cabinets and the Bomb, Oxford University Press, 2007. ^ Lloyd Lorna (1997). "Britain and the transformation from empire to Commonwealth: The significance of the immediate post‐war years". The Round Table. 86 (343): 333–360. doi:10.1080/00358539708454371. ^ "Rating British Prime Ministers". Ipsos MORI. 29 November 2004. Archived from the original on 12 September 2011. Retrieved 2 October 2011. ^ "ATTLEE, RICHARD CLEMENT (1883–1976)". English Heritage. Retrieved 5 August 2012. ^ a b Bridges, Lord (1968). "Clement Richard Attlee First Earl Attlee. 1883–1967". Biographical Memoirs of Fellows of the Royal Society. 14: 15–36. doi:10.1098/rsbm.1968.0002. JSTOR 769437. ^ The Times, 16 December 1948, p. 3. ^ "December03". Btinternet.com. 30 November 1988. Retrieved 2 October 2011. ^ a b "Vandalised Attlee statue being moved to safety". East London Advertiser. 12 November 2009. Retrieved 3 August 2017. ^ "Harold Wilson". Number 10. Archived from the original on 11 October 2011. Retrieved 2 October 2011. ^ "Lord Mandelson joins Lord Hennessy to unveil Clement Attlee statue". Queen Mary University of London. Archived from the original on 18 August 2011. Retrieved 8 July 2011. ^ "Artwork - Clement Attlee, 1st Earl Attlee". UK Parliament. Retrieved 4 January 2019. ^ Cracroft's Peerage. "Attlee, Earl (UK, 1955)". Retrieved 26 June 2017. ^ Brookshire, Jerry Hardman (1995). Clement Attlee. New York: Manchester University Press. p. 15. ISBN 0-7190-3244-X. Beckett, Francis (1998). Clem Attlee: A Biography. Blake. ISBN 978-1860661013. Pearce, Robert (1997). Attlee. Longman. ISBN 0582256909. Beech, Matt; Lee, Simon (2008). Ten Years of New Labour. Palgrave Macmillan. ISBN 978-0230574434. Hill, C. P. (1970). British Economic and Social History, 1700–1964 (3rd rev. ed.). Hodder & Stoughton Educational. ISBN 978-0713116243. Kay, Kingsley (1946). "Development of industrial hygiene in Canada" (PDF). Industrial Safety Survey. Montreal. XXII (1). Archived from the original (PDF) on 25 October 2016. Lowe, Norman (1997). Mastering Modern World History. Palgrave Master Series (3rd rev. ed.). Palgrave Macmillan. ISBN 978-0333685235. Morgan, Kenneth O. (1984). Labour in Power, 1945–51. OUP. ISBN 978-0192158659. Munro, Donald, ed. (1948). Socialism: The British Way. Essential Books. Thomas-Symonds, Nicklaus (2012). Attlee: A Life in Politics. I.B.Tauris. ISBN 978-1780762159. Clement Attlee published his memoirs, As it Happened, in 1954. Francis Williams' A Prime Minister Remembers, based on interviews with Attlee, was published in 1961. Bew, John. Citizen Clem: A Biography of Attlee, (London: 2016, British edition); Clement Attlee: The Man Who Made Modern Britain (New York: Oxford U.P. 2017, U.S. edition). Crowcroft, Robert. Attlee's War: World War II and the Making of a Labour Leader (IB Tauris, 2011). Harris, Kenneth. Attlee (1982), scholarly authorised biography. Thomas-Symonds, Nicklaus. Attlee: A Life in Politics (IB Tauris, 2010). Morgan, Kenneth O. Labour people: leaders and lieutenants, Hardie to Kinnock (1987). Brady, Robert A. (1950). Crisis in Britain. Plans and Achievements of the Labour Government... University of California Press. , detailed coverage of nationalisation, welfare state and planning. Crowcroft, Robert, and Kevin Theakston. "The Fall of the Attlee Government, 1951." in Timothy Heppell and Kevin Theakston, eds. How Labour Governments Fall (Palgrave Macmillan UK, 2013). PP 61–82. Francis, Martin. Ideas and policies under Labour, 1945–1951: building a new Britain (Manchester UP, 1997). Hennessy, Peter (2006). Never Again: Britain 1945–51 (2 ed.). London: Penguin Books. ISBN 0-14-101602-7. Jeffreys, Kevin. "The Attlee Years, 1935–1955." The Labour Party. Palgrave Macmillan UK, 2000. 68-86. Kynaston, David. Austerity Britain, 1945–1951 (2008). Morgan, Kenneth O. Labour in Power 1945–1951 (1984), 564 pp. Smith Raymond, Zametica John (1985). "The Cold Warrior: Clement Attlee Reconsidered, 1945-7". International Affairs. 61 (2): 237–252. doi:10.2307/2617482. JSTOR 2617482. Wikimedia Commons has media related to Clement Attlee. More about Clement Attlee on the Downing Street website. "Archival material relating to Clement Attlee". UK National Archives.